For the past several months, I’ve been making a meal plan every Monday for the week. Along with the meal plan, I also make a grocery list for the week, and a list of all the things I’ll need to make for work. By making a list at the beginning of the week, I only have to make one trip to the grocery store. It also helps me become more creative with my meals. When I write all of my meals out for the week, I can take more time to make a creative and kid-friendly menu that’s filled with the kind of quick and easy meals my family thrives on. That way, we’re not eating the same things week after week. I try to take familiar flavors that we love and turn them into something different and exciting. 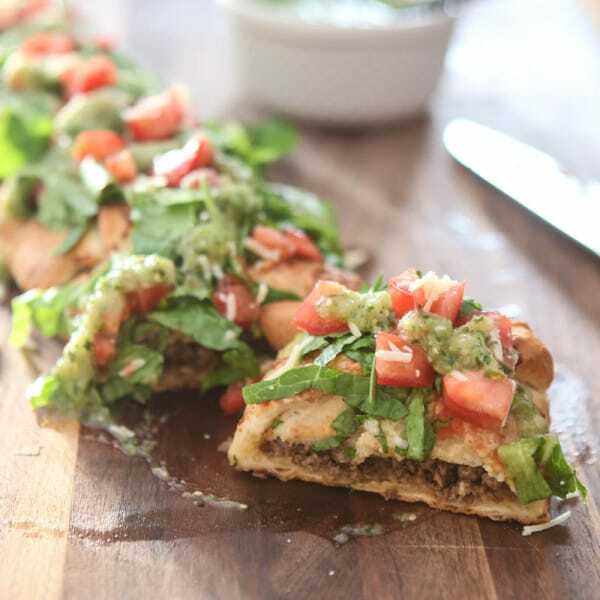 So this week for Taco Tuesday, we made this fun and tasty Taco Braid, inspired by the idea of using convenient and simple ingredients. 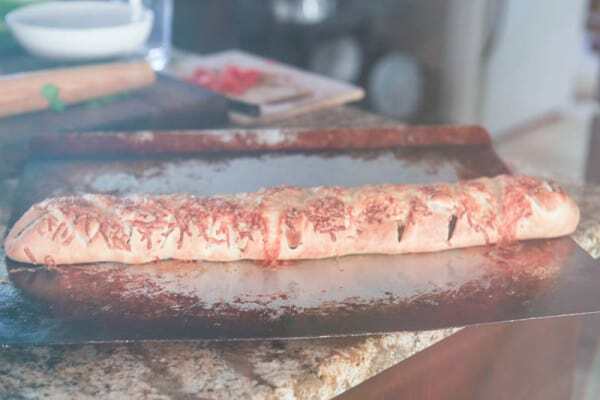 For this recipe, I start with frozen bread dough – a versatile ingredient that’s an easy foundation to a wide range of dishes. 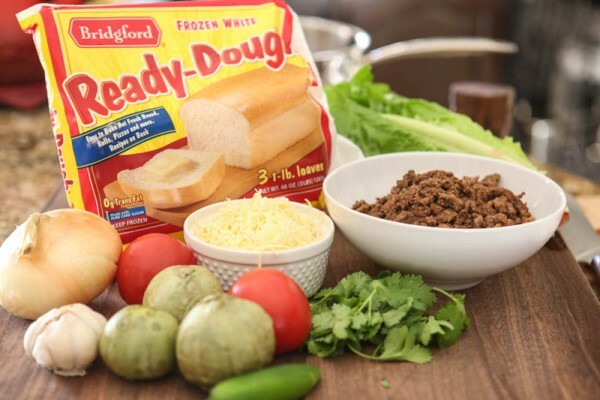 I like to use Bridgford Frozen Ready-Dough® as it is right there in the freezer aisle and always comes out perfect, especially in recipes like this one. Did you know March is also National Frozen Food Month? It’s a time to celebrate all those yummy frozen foods. I know I’ll be stocking up on all the basic and family-favorite frozen foods this month and filling my deep freezer! 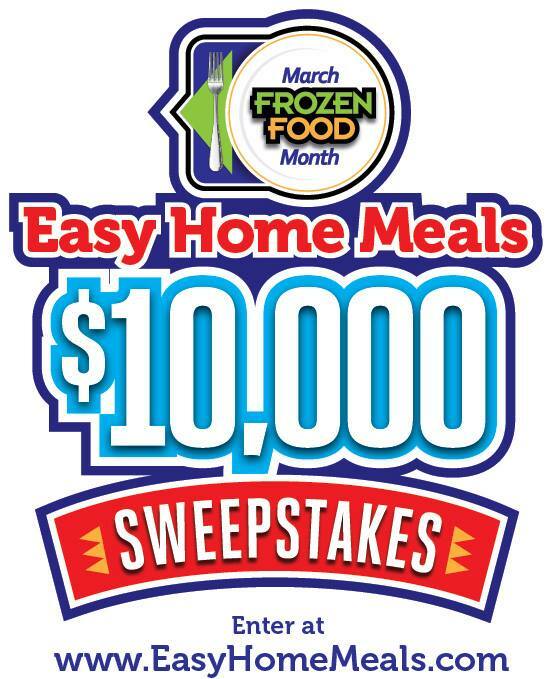 In celebration, NFRA and EasyHomeMeals.com is giving away $10,000. Yes you heard right, $10,000! There will be 5 drawings for $1,000 and one grand prize drawing for $5,000. 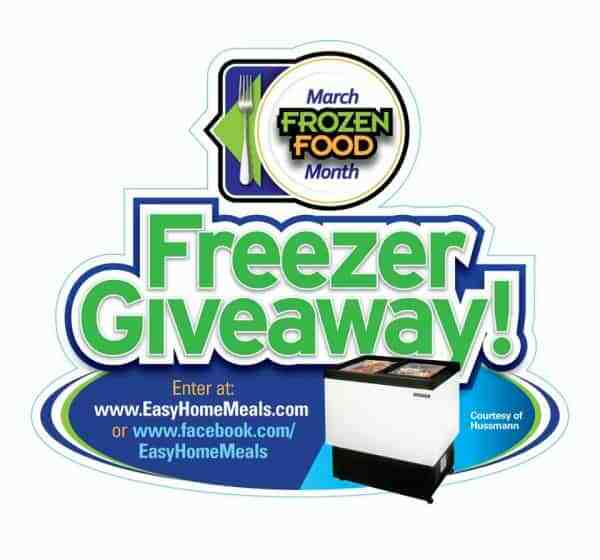 Be sure to head over to EasyHomeMeals.com to enter now. While you’re there be sure to enter for a chance to win a brand new deep freezer too! They’ll be giving away a total of four Hussmann 6.73 cu. ft. Glass top freezers. They are so nice! To start, I thaw my bread dough and let it rise. Then, I brown ground beef with a packet of taco seasoning. The next step is to roll out the bread dough on a large cookie sheet. Then you make cuts in the dough like so. 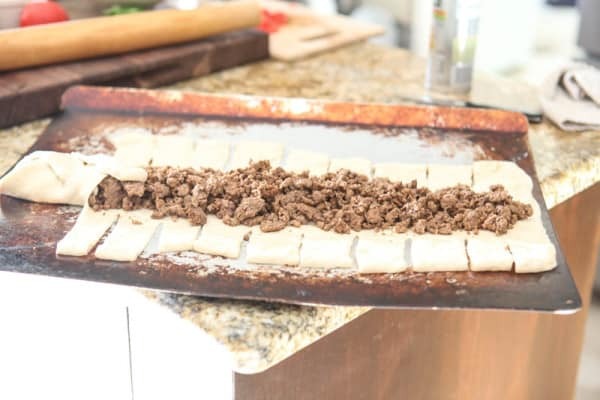 Then place the browned ground beef right down the center. And fold over the dough like this. When it’s all done it looks like this. My son loved helping with this part. It was so fun for him! Next, I top everything with lots of white Cheddar cheese. Place it in the oven at 400° until it is nice and golden brown. 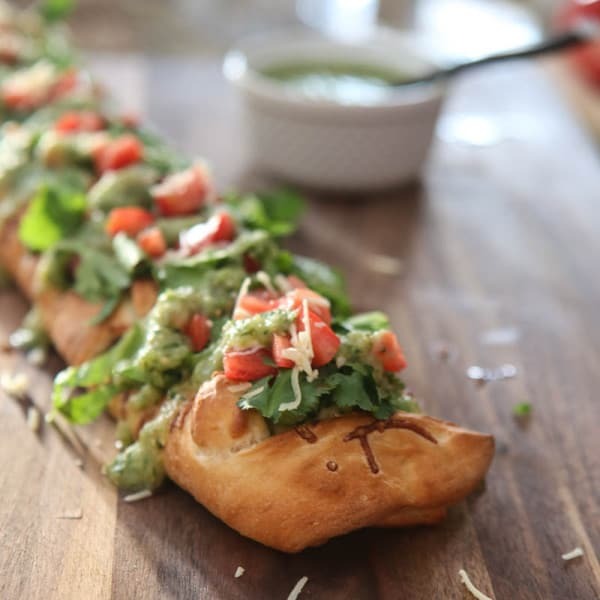 While that’s cooking, we make a fun sauce to top the taco braid. One of my favorite homemade Mexican sauces is salsa verde. 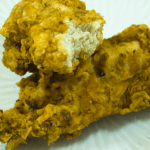 It’s quick, easy and delicious and has a wonderful freshness about it. To start the sauce, I place tomatillos in a pot of boiling water and boil them until tender. This takes about 15 minutes. Next, I take the cooked tomatillos along with some onion, garlic, fresh cilantro, jalapeno and a little salt and put them in the blender. Then I blend the ingredients until they’re pureed. 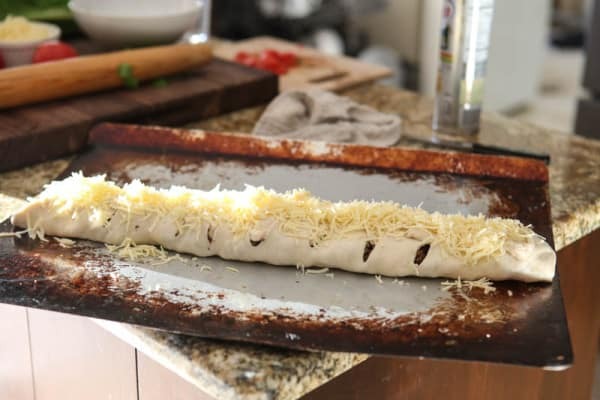 After the taco braid is golden brown and delicious, I remove it from the oven and place it on a cutting board to serve. I like to garnish with chopped romaine, fresh cilantro, diced tomatoes, more shredded Cheddar and lots of the homemade salsa verde. Isn’t that gorgeous? And it’s huge! This serves a big family, or a very hungry family of four. 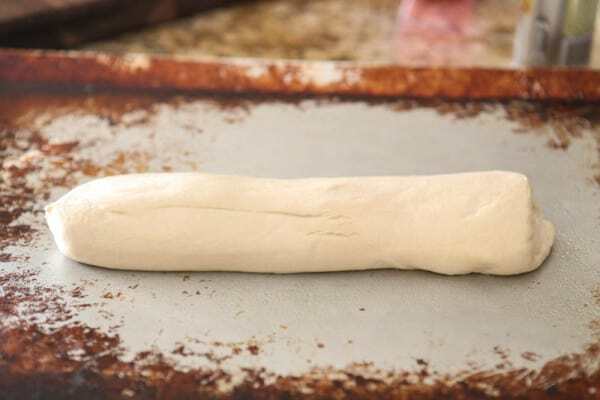 You can find key ingredients like this versatile, pre-made bread dough in the freezer section of your local grocery store. There are countless options for recipes that start with delicious freezer items, like frozen dough. Be sure to browse your grocer’s freezer aisle on your next shopping trip and for weekly meal planning. 1. Heat oven to 400°. Brown ground beef with taco seasonings in a large skillet and let cool. Let the Bridgford dough (thawed) rise according to package directions. 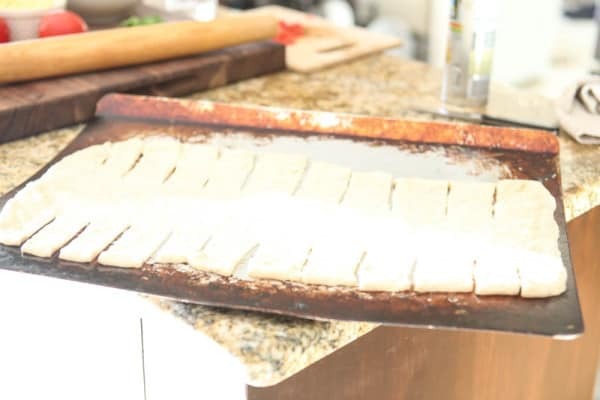 Place dough on a large cookie sheet, roll and stretch out into a large rectangle shape. 2. 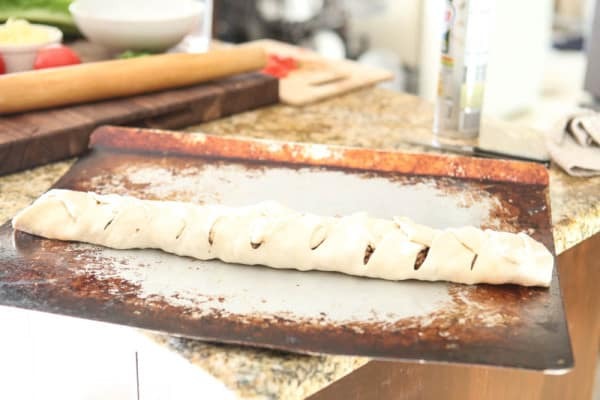 On each long side, cut dough about 2 ½ inches from center in 1 inch sections. Make sure to leave the center and each cut sides all about the same width. 3. 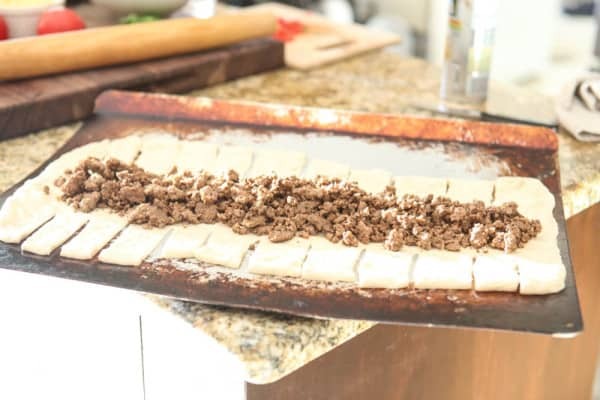 Place browned beef in center of dough and then wrap dough around beef. When done, sprinkle with ¼ cup shredded cheddar. Place in oven and bake for 20 - 25 minutes, or until golden brown. 4. While taco braid is cooking, place tomatillos in medium saucepan and cover with water. Bring to a boil and cook until tender, about 15 minutes. When done, place tomatillos, onion, garlic, cilantro, jalapeno and salt in blender or food processor. Blend until pureed. 5. 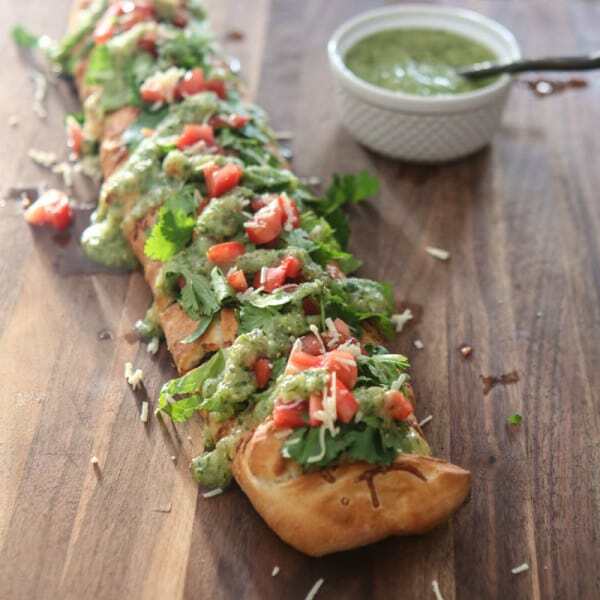 When taco braid is done, remove and place on cutting board or large platter to serve. Top with chopped romaine lettuce, fresh cilantro, diced onion, shredded cheddar and fresh salsa verde. I love that Ready-Dough! This is such a fun, delicious use of it. And creative! Can’t wait to try this. What a cool way to use frozen dough! I’ve never actually used any of those premade doughs in the freezer before, but you’ve got me thinking I need to pick some up. My family would love this! This looks like so much fun! My kids are going to love this! 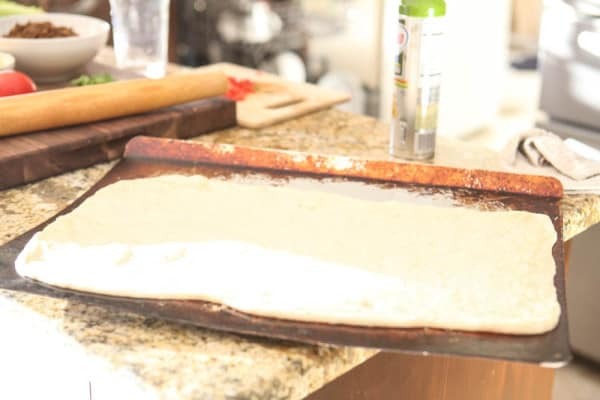 I love using that dough for pizzas too, it’s so simple. This looks awesome and sounds so yummy – love it! 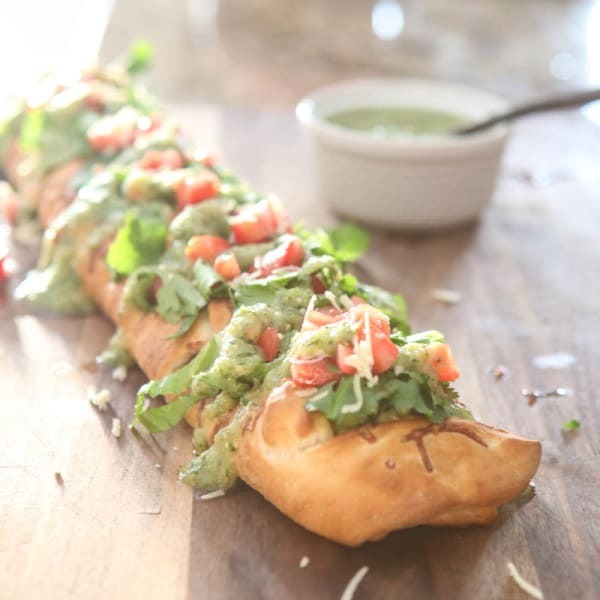 This is such a fun twist on a classic, my kids would go CRAZY for a taco braid! Yum! I’m drooling right now! Thank you so much for sharing this with us at our linky party. What a fun take on tacos! 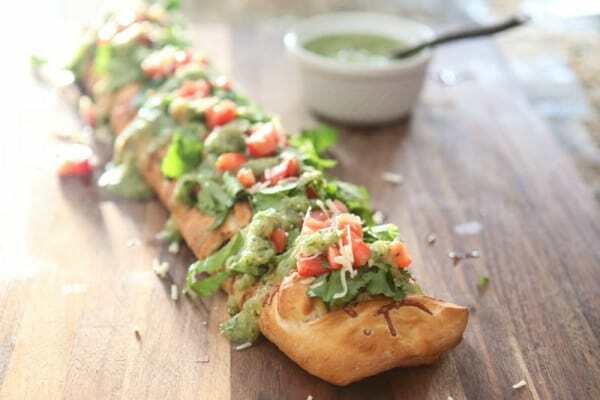 My family would love this taco braid! My fiance would definitely try to eat the whole thing haha! your recipes are amazing!! just book marked your page! Mmm, this looks yummy! I have never tried taco, but I would love to. Tacos are not so popular in Europe.